(1). Philosophy of life and happiness or universal declaration of the beauty of life. (2). Bouquet de Printemps is composed of a crisp heart of the noblest of ingredients (Jasmine Sambac Absolute, Orange Blossom Absolute, Lily of the Valley Accord and Essence of Bergamot), lifted by an exquisite, fruity, gourmand smile. (3). The First Gourmand Bouquet. created exclusively for Lancôme by two of France’s greatest perfumers. LA VIE EST BELLE, THE PROMISE OF CONTINUALLY RENEWED HAPPINESS. La Vie est Belle is more than a perfume. It’s a manifesto, a declaration lit up with joy, an ode to freedom! La vie est belle reinvents itself and draws its own trail. It is the blooming of a new floral composition for a brief while, a heady limited edition celebrating springtime, the season of renewal. Let’s discover this unique, playful trail, the revelation of a thousand petals encapsulated in the heart of the crystal smile. An ode to spring, La Vie est Belle Bouquet de Printemps is a cleverly composed Fruity Floriental that feels as spontaneous and wonderful as the discovery of a new zest for life. A new gourmand delight inspired by the original eau de parfum, it is a nuanced floral arrangement celebrating freshness, fruitiness and crispness. Composed by the perfumers Anne Flipo and Dominique Ropion who have put their stamp on every edition of La Vie est Belle since its creation, the fragrance combines three exquisite flowers in a fresh, gourmand blend. It’s the dance of a thousand petals, escorted by a distinguished essence of bergamot. This bouquet features the iconic iris, the flower of happiness, sweetly complemented as always by notes of vanilla. At its side is Jasmine Sambac Absolute LMR, the flower of femininity, delicate and sensual, joined by a scent of green Williams pear. And at the heart of this composition we find a new lily of the valley accord, a joyous symbol of renewal and deliciously endearing, thanks to a slightly retro, addictive candy accord with accents of vanilla icing sugar and crystallized fruit. A lovely, soft patchouli-based trail warms this intrinsically charming bouquet, a fragrance which captures all the feminine charms of spring. The original La Vie est Belle bottle – inspired by the famous “crystal smile” created in 1949 by George Delhomme for Armand Petitjean, the founder of Lancôme – has been revived to see a new dawn. The clear bottle reveals a fragrant, vibrant rose, filled with joy. On the neck, the wings of freedom have been reinterpreted to resemble a full flower in twinkling grosgrain. From the sparkling detail of the liquid to the graceful beauty of this floral decoration, everything evokes the abundance of a thousand petals encapsulated in this limited edition perfume. 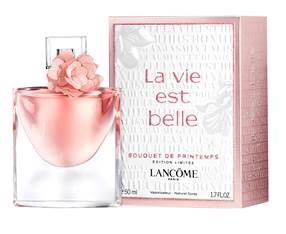 La Vie Est Belle Bouquet de Printemps (RRP €82) will be available from Lancôme counters nationwide from 2017.